I have had my eye on Daughter of the Pirate King for months, and I was super-excited that my hold came in just before our cruise to Mexico. Yay! It was fun, but for me, too similar to Pirates of the Caribbean. SUMMARY: Princess Alosa, daughter of the pirate king, purposely gets herself kidnapped by pirates aboard the Night Farer. As their "prisoner," Alosa plans to use her time as captive to explore the Night Farer searching for a missing piece of an ancient map. But first-mate Riden isn't making things easy for Alosa. He seems to understand her more than most, and he quickly suspects Alosa may be more than she appears. REVIEW: I've had my eye on this book ever since its release date in February. So, when selecting the books to read on our cruise to Mexico, I thought a pirate book would be just perfect! This quick-read reminds me of the Pirates of the Caribbean movies. We have rival pirates, all after the same piece of ancient map. Some of the pirates are bumbling, some are sweet, some are clever, and some are absolutely ruthless. Most of them are only loyal to the most powerful person in the room at the time. And then there's young Riden, the super-hot first-mate in charge of Alosa's captivity. If you haven't already guessed from the description, sparks fly between Alosa and Riden. Of course they do! I have to admit that while this book was loads of fun (especially for cruise-reading), I wasn't blown away. In fact, the plot was just about what I'd expect from the description. I liked the end more than the beginning, and I'll totally see the movie if it is ever made. But I'm sure I'm not the only person who pictured Alosa as Kiera Knightley and Riden as Orlando Bloom. Draxen, Riden's pirate captain brother, would be Johnny Depp as Captain Jack Sparrow. It's fun, but predictable. Even the twist about Alosa (revealed relatively early because it's a huge part of the plot) is apparent long before it's revealed. And I totally didn't buy the fact that Draxen allowed Alosa to have all her things delivered to the Night Farer. Or to sleep unshackled in Riden's room every night? *eyeroll* Why would he do that? She's a PRISONER, and the daughter of a powerful pirate king. Aren't these people supposed to be ruthless pirates? And speaking of Riden and Alosa: I just didn't feel any romantic chemistry between these two. It's based more on chest-lust and clever verbal banter than anything real. Thankfully, the word "love" is never mentioned (though it is implied in a particular incident toward the end), but what is this based on really? They hardly know each other beyond their smokin' hot good looks and a few sad stories about the past. Superficial. 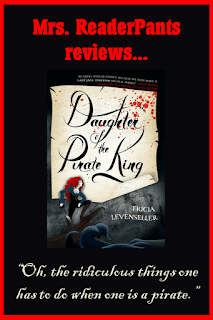 THE BOTTOM LINE: Daughter of the Pirate King is predictable and cliched, but fun. Despite my lukewarm reception, I do think this will be very easy to booktalk with my students. Just try not to think about Pirates of the Caribbean while you read it. STATUS IN MY LIBRARY: On order and expecting it to be popular.